The FTD Happy Memories Standing Spray celebrates a life full of friendship and love. 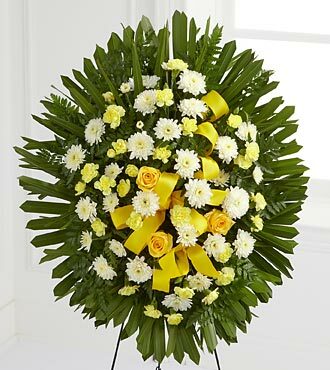 Yellow roses and mini carnations are offset by white chrysanthemums and lush greens beautifully arranged in an oval design and accented with a yellow satin ribbon. Standing on a 48-inch wire easel, this standing spray will bring happy reflections upon a life well lived.